Authorities Monday canceled an order that placed a 15- member San Diego Fire-Rescue Department swift water rescue team on stand-by to deploy to an area north of Sacramento, where an eroded spillway at Oroville Dam was at risk of failing and sending massive amounts of water downstream. The San Diego chapter of the American Red Cross, however, sent four volunteers to the area. About 188,000 people in the Lake Oroville area, about 75 miles north of Sacramento, were evacuated on Sunday. Erosion at the head of the auxiliary spillway had threatened to undermine the concrete weir and “allow large, uncontrolled releases of water from Lake Oroville,” which could potentially exceed the capacity of downstream channels, according to the California Department of Water Resources. Damage to the primary spillway prevented water from being released as fast as it was coming into the lake. Recent rains had filled the lake, and prompted the emergency spillway to be opened for the first time since the dam, the tallest in the United States, was completed in the late 60s, SDFRD spokeswoman Monica Munoz said. But flow over the auxiliary spillway weir had slowed considerably since it began Saturday morning and the Oroville Dam itself remains sound. State Department of Water Resources officials said Sunday that the flow was expected to cease entirely and reduce the erosion on the downstream side of the structure. 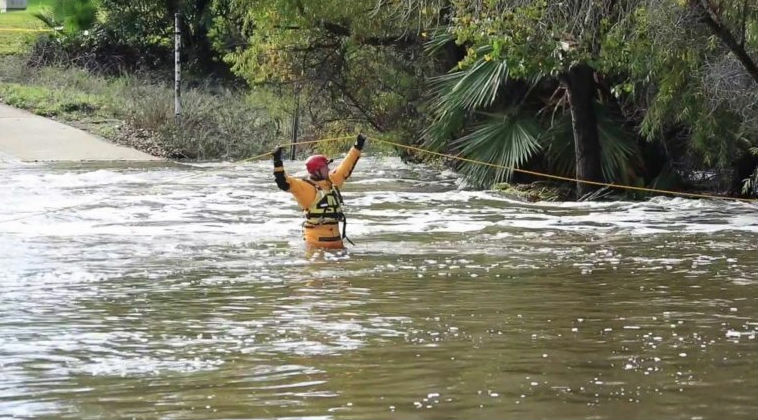 On Sunday night, the water level in the lake fell to below the lip of the auxiliary spillway, the Sacramento Bee reported. Munoz said the local search-and-rescue team would remain ready to deploy should they be needed in another part of the state. The Red Cross in San Diego said five others are on standby to help if more shelters are needed to open in the affected region, and two more are waiting to see if they’ll need to drive an emergency response vehicle to Northern California. “As long as there are evacuation orders in place and local authorities need our help, the Red Cross will be there to provide a safe place to stay, food, hydration and comfort items,” said Bill Earley, CEO for the Red Cross San Diego and Imperial Counties region. Gov. Jerry Brown has issued an emergency order to bolster the state’s response to the situation.